Netflix crying over losing telenovelas to Televisa’s Blim. In February 2016, Mexican broadcasting giant Televisa announced its streaming service Blim, the company’s attempt to compete in the country’s online streaming ecosystem. The new platform created another competitor to existing services such as HBO Go, ClaroVideo, and Netflix Mexico. It also meant that, starting on October 1st, Netflix would lose the licenses to Televisa’s catalog, which had been key to the platform’s control of 39% of the Mexican video-on-demand (VOD) market share. While Blim would capitalize on Televisa’s decades-old slate of programming, the loss could prove significant for Netflix’s success in the second largest VOD market in Latin America. The U.S.-based streaming platform did not let the event go unnoticed. In the lead up to the removal of Televisa’s series from its service, Netflix ran online video spots mocking the new venture. In one, a young man cries in front of the television because his favorite series has been removed from Netflix. A friend comes in to comfort him and asks what series is gone. Is it Orange is the New Black? Breaking Bad? Narcos? The sobbing man finally admits that it is Rebelde (2004–2006), the popular Mexican teen telenovela that launched the careers of its six protagonists and their music group RBD.1 The friend’s reaction betrays the expected response from the audience: who cares if Rebelde is gone when the aforementioned series are still there? By mocking a fictional consumer who relied on Netflix to watch his teen telenovela, the U.S. company disavows this type of user and preemptively mocks their departure from the service. Netflix’s promotional spot mocking the new streaming platform Blim. Noteworthy in this advertisement is the inclusion of Breaking Bad along with Netflix’s original series, implicitly attaching the AMC show to the streaming platform’s own brand. While U.S. broadcast networks have succeeded in maintaining their brand markers on the shows they license to Netflix, this is not the case in Latin America. Moreover, when announcing that a new show is streaming on the platform, the Netflix social media team superimposes its logo or the iconic “N” to a screengrab from the show. With this two-step approach, evidence of a show’s original network disappears in favor of a homogeneous Netflix brand effort. A series on Netflix can readily become known as a Netflix series. 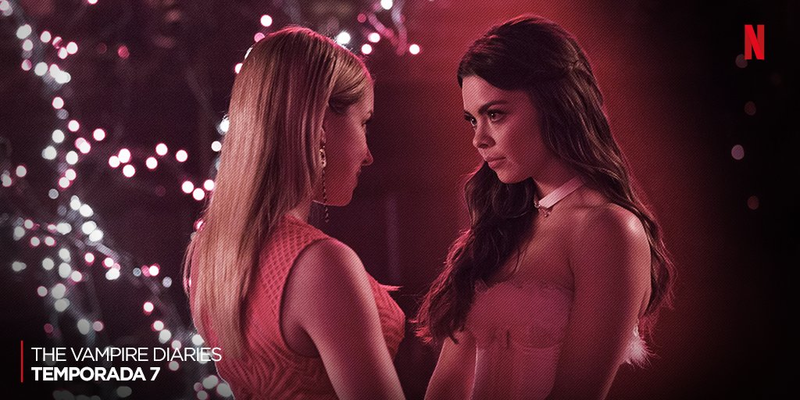 Netflix Latin America re-branding The Vampire Diaries in its social media promotion. At the same time, the video spot does the work of demarcating a “quality” differential between Netflix’s and Blim’s streaming library. The female friend lists only shows that have come to be considered part of the contemporary “Quality TV” cannon as representative of the selection that Netflix’s library will retain. The male consumer’s complaint, in contrast, emphasizes the type of undesirable content that Netflix (purportedly) does not mind losing: telenovelas, a television genre often derided as feminine and in poor taste. As Michael Newman and Elana Levine have argued, the cultural legitimation of television continuously depends on the establishment of taste hierarchies that distinguish good from bad in terms of class and gender.2 This tendency remains in the arena of online streaming. Given the ways Netflix re-brands its catalog for Latin America, the rhetorical move pursued by the American streaming platform in these video spots transfers the discourse of “quality” from television shows to streaming platforms. A second promotional spot emphasizes this point. It features a montage of close-ups of women from Televisa’s telenovelas as they cry profusely and in an exaggerated manner. Over these shots appear the phrases Es difícil decir adiós. Muchos las extrañarán. Otros no tanto. [It is hard to say goodbye. Many will miss them. Others, not so much.] This second spot reinforces the gendered distinction that the first one gestures at. In the first, casting a man as the undesired, telenovela consumer and a woman as the preferred, quality-TV connoisseur contributes to shaming the former for watching content meant for women and teenagers. In the second video, the wailing, disheveled women from Televisa’s shows contrast with the composed female lead of the Spanish series Velvet (2014– ) seen in the final shots. The spot ends with a cut to the male lead in Velvet smiling at his love interest when the words Otros no tanto [Others, not so much.] appear. The last shot returns the gaze to the male character as the decider of which women to miss and which to forget. Replicating “quality platform” rhetoric in anti-Blim news coverage. 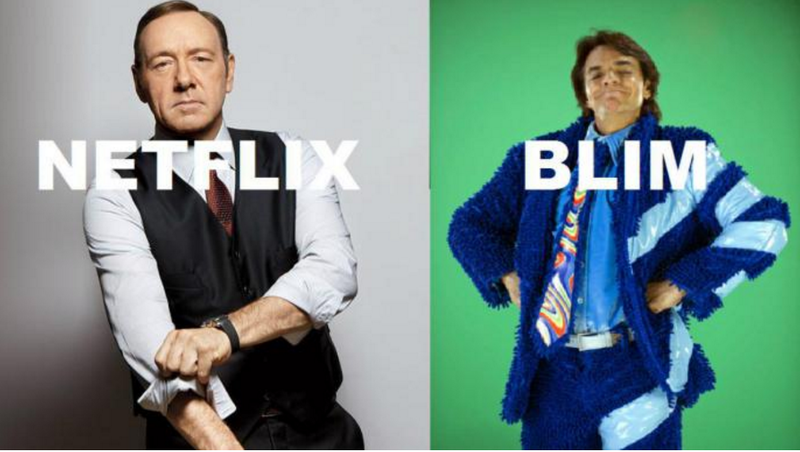 In their coverage of these anti-Blim spots, online news outlets used an accompanying image of Kevin Spacey and Eugenio Derbez as a metonymy of the Netflix-Blim distinction. On the left side, Kevin Spacey is dressed as his character Frank Underwood from House of Cards, rolling up the sleeves of this dress shirt and staring seriously into the camera. Eugenio Derbez, in contrast, is dressed as his character Ludovico from La Familia P.luche, sporting the character’s iconic plush, oversized electric blue coat and a tacky tie. The image succinctly repeats the “Quality Platform” rhetoric of the Netflix spots, setting up the American streaming platform as serious and professional against the ridiculous and crass Mexican platform. 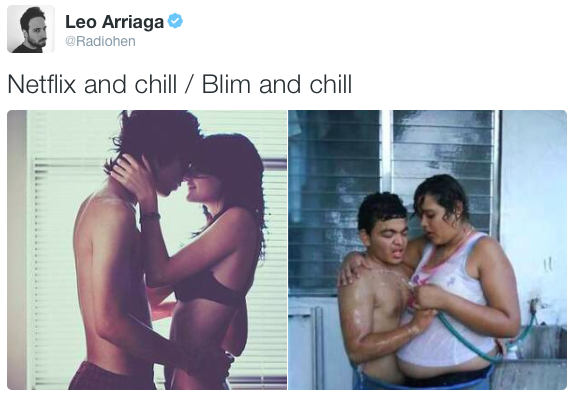 The picture taps into a popular meme that first arose in February 2016 when Televisa announced it was developing Blim. Throughout social media, users created and shared images that juxtaposed a screen grab from a show or film from Netflix with one from a Televisa telenovela. It was not long before the meme acquired classist tones. Pictures signifying Televisa were often those of the lower-class characters in its series. The Netflix-Blim meme became shorthand for high-production value aesthetics worthy of praise versus low-quality stills worthy of mockery. Further, poor people become the punchline for an elitist online content turf war. The popular resignification of Televisa’s programming as an undesirable, low class aesthetic is in some ways unsurprising. The broadcasting empire has long profited from conservative programming that perpetuates the nation’s class distinctions, devalues rural and working class ethics, and sets up social mobility as attainable only through heterosexual marriage.3 These memes then perpetuate the ideologies of class endemic to Televisa’s programming by extending its hierarchization transnationally to the distinction between Netflix and Televisa programming. 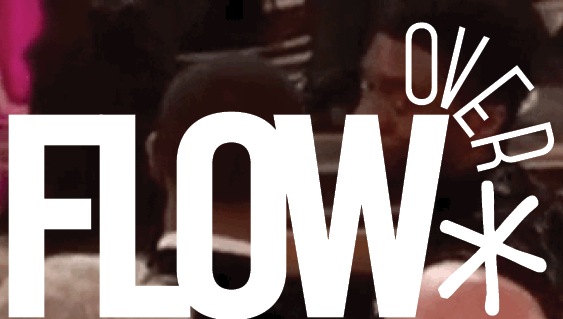 Poor people become the punchline in the turf war between competing streaming services. What remained unremarked in mainstream reactions to the release of Blim was the fact that, with the licensing lapse, Netflix lost access to a popular type of programming, Telemundo’s super series like El Señor de los Cielos (2013– ). Super series are reformatted telenovelas broken up into multiple 70-episode seasons instead of a single run of 120 episodes. They have succeeded in increasing Telemundo’s domestic market share in the United States, especially with younger and male audiences, and they attract the digital-savvy audiences that Netflix tries to court in countries like Mexico.4 Telemundo has also mobilized the Quality TV rhetoric as a marketing strategy to differentiate these series from traditional telenovelas by emphasizing their higher production budgets, on-location shooting, and action sequences. Netflix’s strategy of mocking telenovelas and the people who watch them did little to obfuscate how important a section of this television genre is for the streaming service’s market dominance in the Mexican VOD market. It was not long before Televisa struck back with its own promotional spot mocking Netflix. Featuring two actors with an uncanny resemblance to those in Netflix’s ad, the male consumer in the Blim promo celebrates that he can watch Rebelde once more while his friend mourns losing El Señor de los Cielos from Netflix, only to be reassured that it is available on Blim as well. The last laugh may be short lived since a new agreement between Telemundo and Netflix would give the latter licensing rights to the U.S. network’s new seasons, including upcoming ones for El Señor de los Cielos. Still, Netflix’s initial reaction to the release of Blim remains a pointed reminder of the class markers latent in issues of genre and platform branding at a transnational scale. The video spots speak both to Netflix’s ongoing struggles to secure content when seeking new markets and to its increasing efforts to build a “Quality Platform” brand. That the opponent in this instance was Televisa reminds us that the entire affair is a race towards monopoly. As one critic noted, it would be great “to see Latin American services giving Netflix a run for their money in their home markets… just not Televisa.” In the end, this streaming war between Netflix and Blim comes down to two media giants slamming each other yet devaluing their users in the process.